Australians could soon be paying a new “flood tax”, with the raised revenues being used to fund recovery efforts in the flood-stricken Queensland. 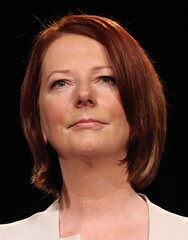 On January 21st the Prime Minister of Australia Julia Gillard stated in a television interview that the federal government is now investigating the possibility of instating a national tax to fund the recovery and rebuilding efforts following widespread floods in the Queensland region. According to the Prime Minister, the economic impact of the floods is very severe, although no conclusive reports have been released yet on the cumulative cost of damage. However, upon initial assessment of the flood impact, Julia Gillard conceded that the national GDP value will be decreased in 2011, and food prices across the country will also increase. In light of the potential recovery and reconstruction bill, calls have been made to abandon the Julian Gillard’s pledge to reach a budgetary surplus by 2012. The Prime Minister has also been urged to make use of the AUD 43 billion already earmarked for the country’s broadband rollout program to fund rebuilding costs. She rejected both proposals, saying that raised taxes and additional spending cuts are more likely, and ultimately better for the economy. The nature of the potential tax is currently being discussed within the federal government. The tax could take the form of a once-off payment, or a temporary small weekly tax. Tony Windsor, independent member of the Australian House of Representatives has even suggested that a weekly tax may be instated on a longer-term basis, to build financial reserves to fund any future natural disaster relief programs. He explained his idea, saying that a nominal tax of AUD 1 on each employed taxpayer would raise approximately AUD 1 billion per year.